On tomorrow night’s Fresno card headlined by Jose Carlos Ramirez defending his WBC super-lightweight title against Danny O’Connor, a mildly interesting heavyweight match-up is scheduled. 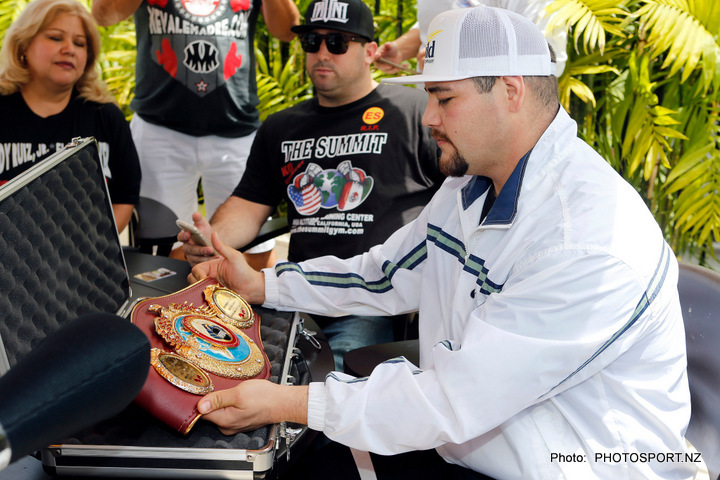 Once-beaten former WBO heavyweight title challenger Andy Ruiz, 30-1(20) will have his second fight back since dropping that closer than close decision to Joseph Parker in a fight that contested the vacant WBO strap in December of 2016. The 28 year old “Destroyer” will face seasoned old campaigner Kevin Johnson, 32-9-1(16). A huge betting favourite to win – on some betting sites you can get Johnson at 16/1 and Ruiz at a whopping 100/1 – Ruiz should be able to further rid himself of the rust he picked up during his inactive 2017. Depending on which version of Johnson turns up, this one will possibly be either a short affair or a long night. “KingPin,” now aged 38 and winner of just three of his last nine, has questionable desire these days. After he was blasted out inside a couple of rounds by Anthony Joshua in May of 2015, Johnson announced he was retiring from the sport. It lasted almost two years, but in March of 2017 Johnson was back. Since then he has gone 3-2. If – and it could prove to be a big if – Johnson has some fire in his belly and is willing to let his hands go, he might give Ruiz a decent test. Ruiz, for many the man with the fastest hands in the division, seems to have everything on his side here: age, freshness, desire. Of course it could be questioned how much Ruiz really wants it. In the opinion of more than a few, Ruiz, had he dug down more, could have pulled out the win over Parker and won a world title. Ruiz is currently a long way away from a second shot at world glory but his comeback should not be derailed by Johnson tomorrow night. That said, if he stays in his shell and is content to stink the place out, Johnson might stick around for a few rounds and make Ruiz look less than impressive in doing so. Johnson has been stopped just twice, after all: by AJ and, last time out in March, by unbeaten 22 year old Croatian hope Petar Milas.